Canning Relish - Apricot Red Pepper Relish - Canning Homemade! When I'm in the mood to do canning in the off season I try to look for recipes that have dried or frozen fruit as one of the ingredients. In the Complete Book of Small Batch Preserving I spotted earlier this winter the Apricot Red Pepper Relish which uses dried apricots and 1/4 cup of Cowboy Candy. I was given a red pepper from the neighbor and making a jar of this relish would be a great gift for them when they come home from vacation! The recipe is more of a savory jam than a relish as it requires using liquid pectin. 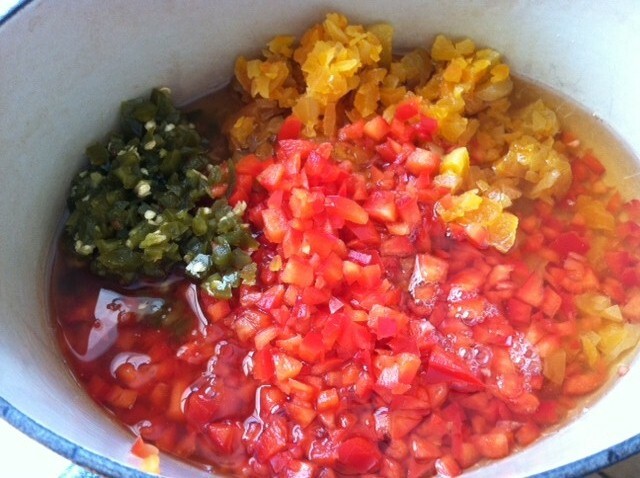 Combine vinegar, red pepper, and jalapeno peppers in blender or food processor. Process with on/off motion until finely chopped but not pureed. Transfer to large saucepan. Add apricots and sugar. Bring to a boil, reduce heat and cook for 5 minutes. Remove from heat and stir in pectin. Ladle relish into hot jars to 1/2 headspace. Remove air bubbles and refill if necessary. Wipe rims with wet papertowel and add hot lids/rings. Process for 10 minutes in water bath canner at a full boil. Remove from canner and leave undisturbed on counter overnight. Remove rings and store in pantry.